Liz is one of your soaraway Shoot Up’s regular readers and contributors; she is also the proud owner of Lola the Labradoodle who is being trained to detect Liz’s hypos. I’m a wife, mother and poet. I’m also a brittle diabetic. It’s very difficult to keep my blood sugar levels in the normal range. Any little thing can send them whizzing up or plunging down – being excited, worried, sad or happy, a windy day, a hot day… It’s often only retrospectively I can guess what might have been a reason for expected unexpectedness. There is no way of predicting how it will react. It might go up or down. And I have no warning symptoms of low blood sugar – which can drop within 15 minutes from a too high 10 to a too low 2. Because I can become hypo without realising it at all, I can’t drive. Travelling and stressful situations are difficult. I cope by doing lots of blood tests. I use animal insulin (which has a slower and less aggressive action than ‘human’ or analogue insulin). I also stick to a low GI, low carbohydrate diet, which has also helped. And I have an insulin pump that gives me the ability to make very fine adjustments to my insulin levels. My control is much better than it used to be. But it’s still not good. Night times are worst – I wake up once or twice, or if I’ve been doing something exciting, three times to check. But in between, I can still – and have – become unconscious. Concerns were raised after a particularly prolonged early morning low blood sugar. My husband checked in on me before rushing off to take our son somewhere – a two hour round trip. He asked if I was okay, I said yes. But as he left, and I tried to get out of bed – I realised I wasn’t okay, in fact, I couldn’t move. And just then my ability to shout out also left! When he came home two hours later I was unconscious on the floor. This is how I became a Lola owner. I had already put my name down on a list to tentatively talk about having a dog trained to alert for low or high blood sugar. Now while I was sure, my husband wasn’t so sure – could it really work? Would we be capable of training it? He was a cat person, not a dog person. There were lots of things to think about, but eventually – my time had come! We didn’t follow the normal route – I wanted a particular type of dog, as I do have teensy tendency to OCD-ness. I wanted a dog that doesn’t shed, or smell too doggy. I wanted a small one so I could carry it over dirty ground. We decided we would like to buy tramadol no prescription our own dog, but this would mean training it ourselves under supervision from the charity Medical Detection Dogs. 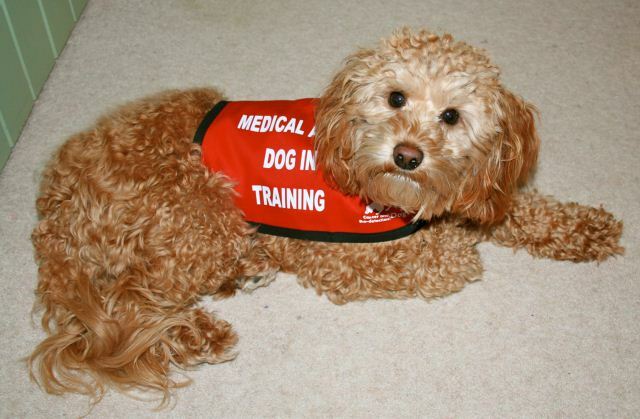 Medical Detection Dogs are the only charity in the UK training dogs to do this specialised work. They assessed me as to my suitability to look after and train a dog. And then, with advice as to how to choose a suitable puppy, we chose a puppy, Lola the Labradoodle. She was a small bundle of golden-apricot curls and so scrummy we all fell instantly in love with her, even my husband, who, like the rest of us, is now utterly besotted. The hardest thing for us was to train Lola NOT to jump up at people. She’s very good when out and about now, but if she sees a friend in our village she does still get excited! All my friends know that they have to ignore her until she is sitting before she can be stroked. We still have problems – she runs to greet house visitors and then realises – I have to sit, so she sits, but her sit looks like it is being performed on a small vibrating portion of floor. As soon as the hand gets to her she bounces up like she was sitting on a spike. In the end I have to go to shut her behind a gate – but she pre-empts me, dashes to the gate and sits this side of it on her cushion – not only sits, but lies down, and looks up with an angelic expression – you see? You see what a good dog I am? Not only am I sitting, I have lain down, I deserve LOVE! So then she gets a pet, the cushion goes swinging from side to side, she slips off and jumps up – and ends up behind the gate. At the same time as training Lola to sit at kerbs etc, she has been introduced slowly, step by step, to a programme designed to help her recognise when my blood sugar smells ‘different’. I need her to be able to tell me when I am getting low, not when I AM low. The training is complicated, and incremental, but to put it in a nutshell, Lola gets a treat, a very high quality treat that she doesn’t get at any other time, if she alerts me to the fact that my blood sugar is getting or is high or low. Lola does alert, and gets it right a lot of the time (not always! but we are doing intensive training to get her to be more consistent). She alerts several times a day. She does this by coming and sitting beside me and making a small noise. If I ask her what is wrong she looks at me intently and tries to get at my hand. I let her smell it and she licks it to get the taste and if I am high or low she paws me. If I don’t notice her trying to get my attention, she nudges my leg. Or stands on her back legs and does a little dance. She has alerted loads of times during the night. Once, after we and Lola had all had a tiring day, she didn’t alert until I was unconscious – my husband did not wake up to her normal whines, so she ‘escalated’ her alert and barked and woke him up. Part of her treat at night is to sleep next to me on the bed. My temperature falls whilst unconscious and she helps me get warm again! I would never, in my old OCD days, have predicted this. I can hardly believe it – but she has cured me of worrying that much about germs – I SLEEP WITH A DOG. Yes, me. And not only that, she gets muddy. She rolls in mud. I shower her after in the bath – but I don’t carry her over mud as I envisaged, I love her so much I can overcome my OCD side and even enjoy watching her become black and sticky. And I have become fit – I walk an hour every day, and have been out far across the fields, something I would never have been brave enough to do before Lola. She has changed my life. And did I mention how scrummy she is? What a great idea @lizz (and very cute too). How long do you think it’ll have taken you by the time she is fully trained? I’m not sure I like the idea of giving a very high quality treat for recognising hypos. The husband sometimes spots a hypo before I do, I’m just hoping he’s not reading this or it could get expensive. I thought husbands were intrinsically expensive ? Gosh! My OH hasn’t thought about exploiting that idea – so I think you are probably safe! She is almost trained now. She is just two. It’s hard because we live a long way fro the charity so visits are few, but we are getting there. Some dogs take a very short time to train, others take longer. Sweet enough to eat (please don’t) 🙂 So you don’t have seperate sniffer called Heidi, for when you’re hyper? LOL! No – Oh did point out that Lo-la was an appropriate name! We didn’t choose it because of that though. I suggested Kinks because of her coat, and OH said Lola which was a Kinks song. She does also alert for high blood sugar. She got that first. Does she have to wear her uniform for public places to allow her in, or can she gain ingress when in civvies, too (thanks to your persuasive charm)? I think any type of dog as long as it is intelligent, biddable, trainable to a high standard, very attached to its owner, has a good sense of smell. She wears her uniform at all times in public places. By public places I mean shopping, restaurants etc. Out in the fields is her off duty time and she does not wear it there. Is had to be said – as well as being very clever, Lola is almost infeasibly cute! So select a beast, not a beauty? Since it’s a charity, does MDD provide the training program & waistcoat free of charge… and is it only available to British citizens? We bought Lola ourselves as I was so fussy about which dog! But normally the dog would be supplied by the charity, puppy walked and trained in the early stages by a volunteer. You have to train the dog, and it is ongoing and relies on commitment for the rest of its working life. i don’t know if the charity pays for food and health bills etc for dogs supplied. i suspect it depends on the situation of the person needing the dog. We pay for everything for Lola, as she is our dog, and we also pay for her coats, it’s the least we can do. I think it would be only British people as the charity s quite small and run off their feet doing what they are at the minute. There are other schemes in France, for example. We raised money last Christmas and have plans to do so again. In fact I have abig pile of children’s poetry books donated by my children’s poet freinds to raise money for the charity, which I must get going on! Please put a space in ‘abig’ there and pretend the ‘i ‘and the ‘e’ are the other way round in friends. Well, you could ask, but I think the answer would be – no. The route is complicated and incremental and you need a great deal of support to get the training exactly right. There are lots of questions, as you are doing the training. And who would you ask? Well, the only people who would know the answer would be the charity, but then you would be taking up time asking for help when they are trying to concentrate on someone who has been on a waiting list for 2 years. When the dog is trained it has to take exams or be assessed as up to a standard in all sort of ways. After that they get given a coat and a pet passport which entitles them to go into public spaces except a commercial kitchen. Depending on circumstances at the time. 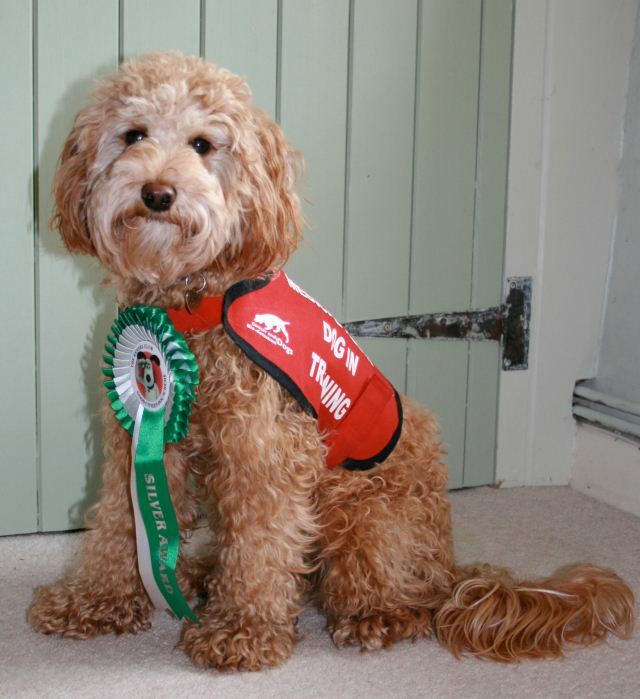 You can however be put on the waiting list to have your own dog assessed for training. I think it’s scintillating discussion like this that keeps the readers coming back. I know. We should have chosen a dog without so much touch appeal. We have had to add time onto any outing – time to explain what sort of dog she is , where you can get one, are they really non-shedding (only reliably if Australian, as she is) etc and also, what is she for, how does she do it. On every outing there is at least one person who says they have no hypo warning symptoms and would like one. I’m currently training my golden retriever to be a Diabetes Alert Dog. Its encouraging to hear stories like this. I hope you will post more on her progress. wow Lizz thank God for Lola its times with the lows that you’ve described when you realize that diabetes can be a very serious problem however well you try. My old dog would occasionally bark at me for no reason when I didn’t feel low but she knew. Our young dog is hopeless but I may give him a go now I’ve read your report. I’m really pleased that Lola is enabling you to get on with your life though and yes I think she looks very cute… Just don’t tell my dog Ollie! I did have to check that this wasn’t April 1st, the engineer in me takes a healthy dose of skepticism in this. What are you skeptic about, Paul? I guess symptoms vary from person to person but my wifes can’t always tell when I’m having a hypo & vice versa so I’m a little skeptical a dog could be trained to pick up on it. Also I can get quite sulky when told I’m having a hypo, although thinking about it if a dog could be trained to nag (bark) till I did something that’d be useful. Does lolas uniform have a little medic alert pack for human assistance? My wifes not a fan of pets, so I’m jealous as I won’t be able to get one until they come on prescription! It’s not symptoms, it’s smell – they can smell the change in blood sugar. They get high and low quite quickly but then have to be very carefully trained to alert at the level you want, 4 or 10 in my case. So hopefully what would happen is she would alert for you before you became irritable, when you didn’t mind checking and doing a blood test, and having something to eat, or taking a correction. Do you have to calibrate her twice a day? And does she need a two-hour warm up period every 6 days? Ah, she needs a one hour warm up in a field once a day. And a session of warm ups in the lounge which involve trying to pull the tail off of any one of her 400 soft toys. She is calibrated quite often! She also comes with the side benefits of warm and heartfelt greetings when you come in, even if you’ve only stepped outside to get the post. If away for longer, she gives you a hug by burying her face in you. She never, ever holds a grudge, and is all soft and velvety. And at my time of life, it’s great to have soulful brown eyes gazing at you adoringly. One of my cats does that loving, blinky-eye thing but its never “soulful”! See, I’m a cat person too, but I’ve fallen in love with Lola already. 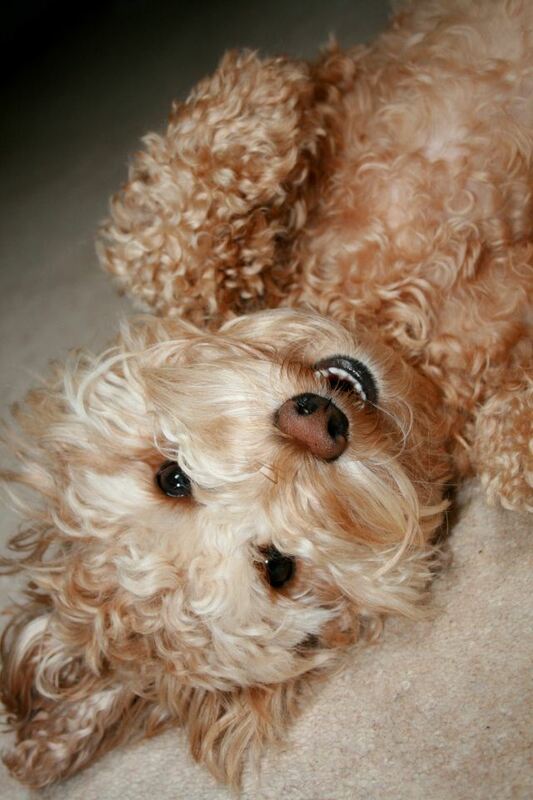 “Dog-augmented pump therapy trumps multiple daily injections” – latest study by JDRF! Hi Lizz.. Have you asked Stripykat to make Lola a jacket? I have not. Funnily enough we do have coat-related issues. Lola hates coats. But shivers. She has many coats – about 6. but none quite right. She has a special rain one which does up and has a flap under her which keeps her dry all over, but she walks like her legs have no joints in it. She has two fleeces which have legs – a purple one with 4 legs and a blue one with two. these are wind and rain proof and very warm and also breathable, but she doesn’t like the leg bits. She also has a brown coat which just does up with a velcro flap under her chin and a strap under her chest, which she prefers being put into, but it is too big. We really need something soft and cotton and which fits. Do they have to be trained from a puppy? I have three dogs already – could one be trained as an adult? I don’t really know about whether an older do could be trained. I suspect so, you can train a dog at any time to do anything, and I don’t see why this would be any different. I think it would have to be youngish still though. I do know though that you can only have one dog if it is a service dog. I has to be fixated on you, not distracted by other dogs. We are about to sign an agreement that says we cannot bring another dog into the house. It wouldn’t really be fair on the other dog/s, as the ‘special’ one would be allowed to go out with you when they couldn’t.